Mr. Chidambaram pointed out that the country’s public sector banks, in which the government holds the majority shareholding, did not have any “undue exposure” and whatever they had were in accordance with the Reserve Bank of India guidelines. ICICI Bank, however, did have some exposure and it had made the necessary disclosures. .. is a five minute conversation with an average voter. I have been following (Brahma) Chellaney's articles on the nuclear deal. From the beginning he has been assiduously following a line quite opposite to the one held by the government. In a democratic country, every citizen has a right to express his or her opinion, and Chellaney is one among them. He, however, appears to be a diehard critic of the deal for reasons best known to him. Excuse me, "reasons best known to him"? Here's this guy, who has been busting his hump, wading through the text of the various documents pertaining to the deal and the NSG waiver, and putting down bulleted points for why he is against the deal, and we still get questions like this. Reminds me of the Friends episode where Phoebe announces that she wants to carry her brother's baby, and Ross lists a number of reasons why she needs to think this through, and Phoebe's reacts "What's your point?" Staying on the nuclear deal, there seems to have been a sort of realignment among the supporters and opponents. Hindu started out as a critic, then revised its stance, and is now once again giving prominence to things that are wrong with the deal. DC, on the other hand, started out negative, but is keeping quite nowadays -- Chellaney's columns notwithstanding -- about the various bits of bad news (no columns from Seema Mustafa, too). It started with the metaobject protocol, moved on to metaclasses, and culminated in this paradoxical statement from Wikipedia: "[T]he metaclass of Metaclass is an instance of Metaclass." 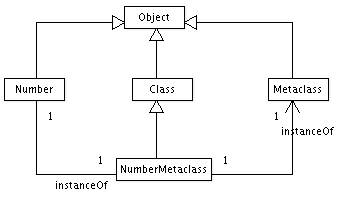 A class is a singleton instance of a metaclass. A class is also an object. A metaclass is also a class (as well as an object, of course). A metaclass, being a class, is a singleton instance of a metaclass. Metaclasses are instances of the class Metaclass. Which, I think, leads us to the Wikipedia quote. I started off with the profound quote from the Tao Te Ching, but I'm not really sure what the utility of this stuff is, unless I'm implementing a Smalltalk virtual machine. Well, I can at least sleep peacefully at night, knowing that if ever I run into the Wikipedia quote again, I know that I can figure it out. Sort of. Question: I have done a search on Lycos for your papers and I only found two titles: the STL manual and a resume of you presentation of STL to the standardization committee. Answer: The book is "The Ada Generic Library: Linear List Processing Packages", by David R. Musser and Alexander A. Stepanov, Compass Series, Springer-Verlag, 1989. It is not really worth reading. Trivia: there are 23 occurrences of the word 'class' in this post.